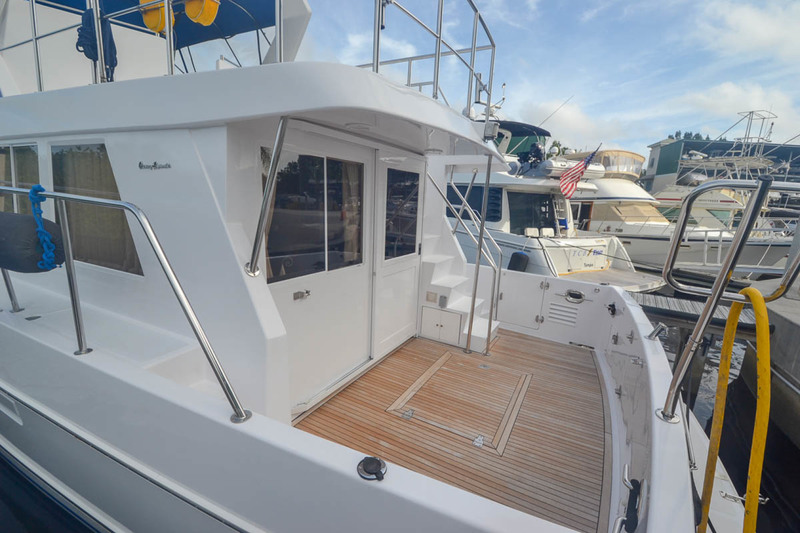 The Ocean Alexander 510 Classico is a yacht quality raised-pilothouse design like-new appearance. 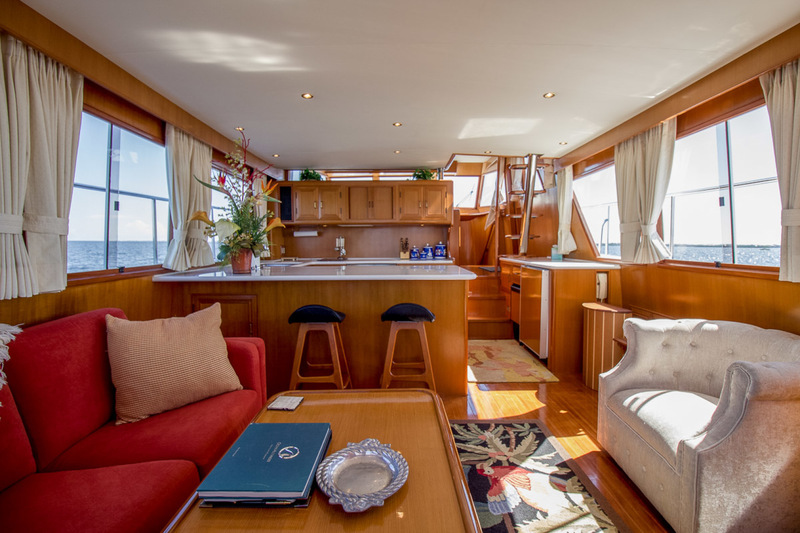 This model is a top choice of serious Northwest passage-makers or Bahamas cruisers. 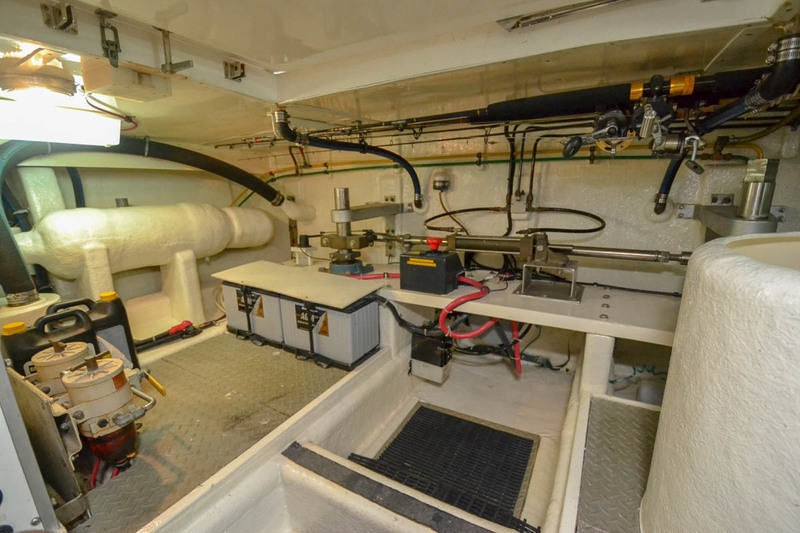 They're heavily built on a modern semi-displacement hull with cored hullsides and a keel deep enough to protect the props while only drafting 4 feet. 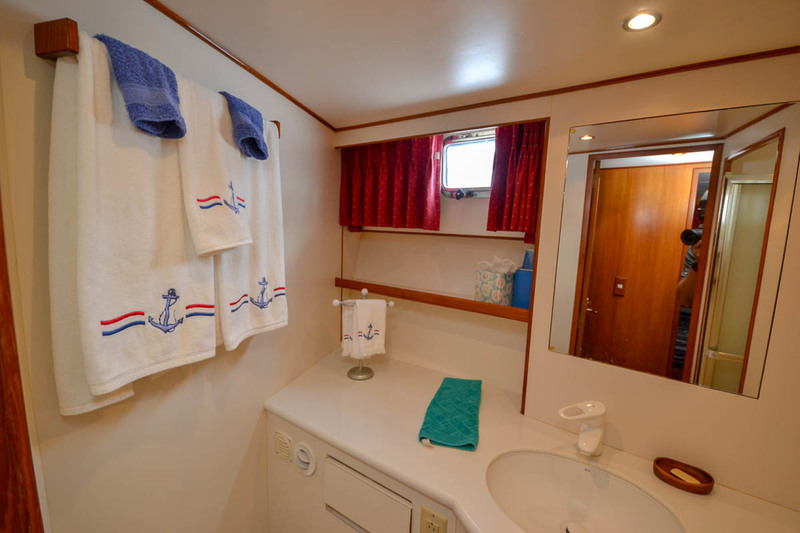 This is the three-stateroom layout, all with with custom window treatment and matching bedding. 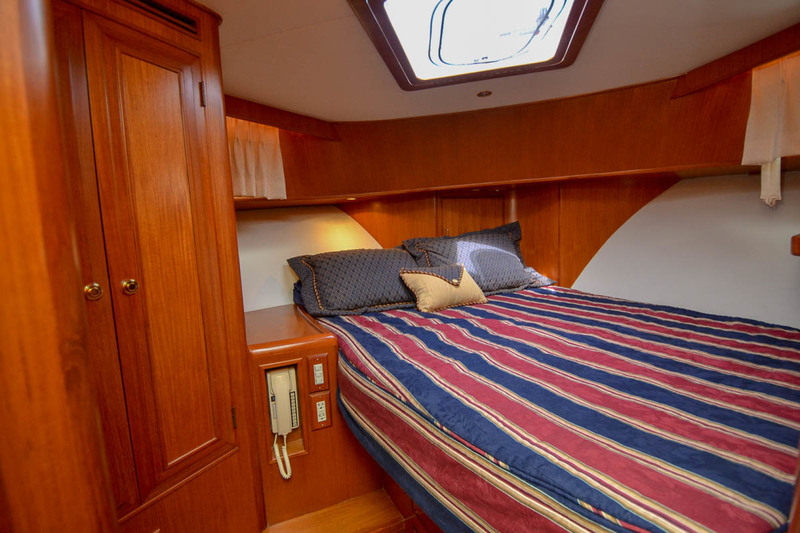 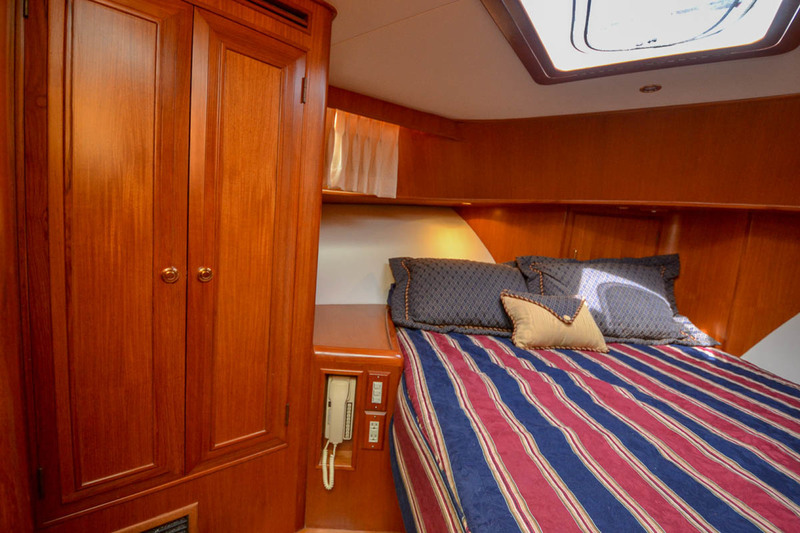 The master is full-beam with a walkaround berth, excellent storage, two cedar lined closets and roomy head with separate stall shower. 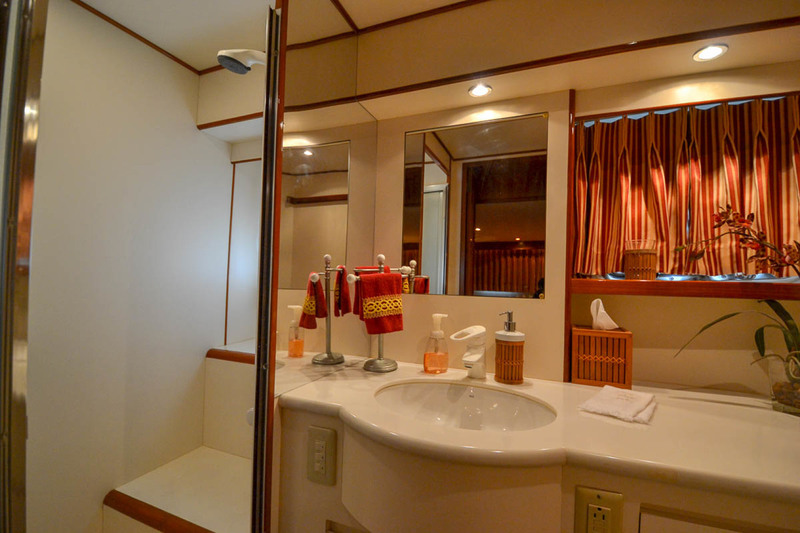 The forward VIP stateroom shares a bathroom with a bunkroom to port. 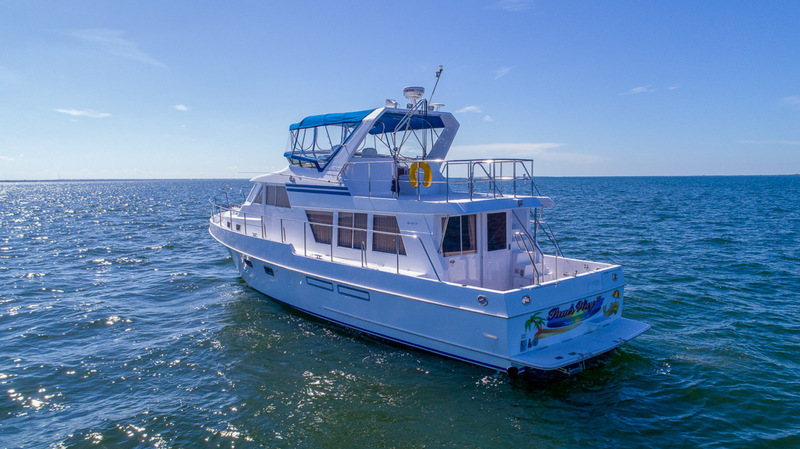 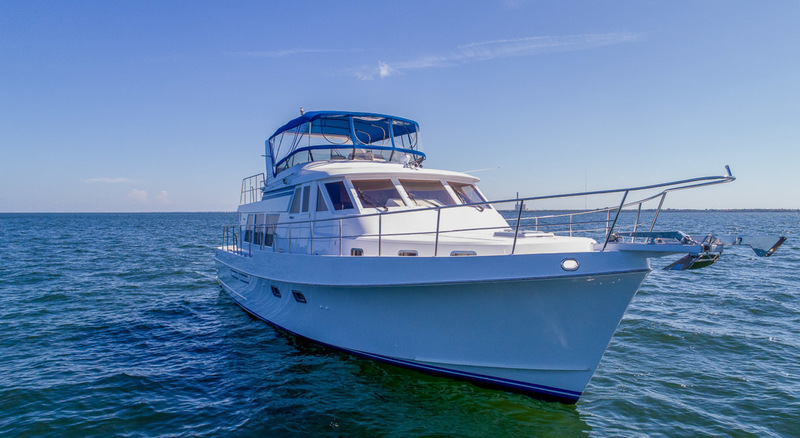 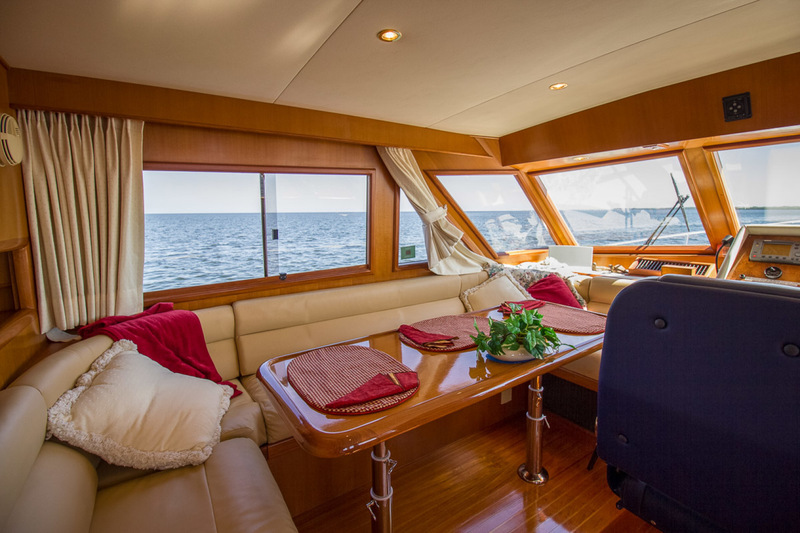 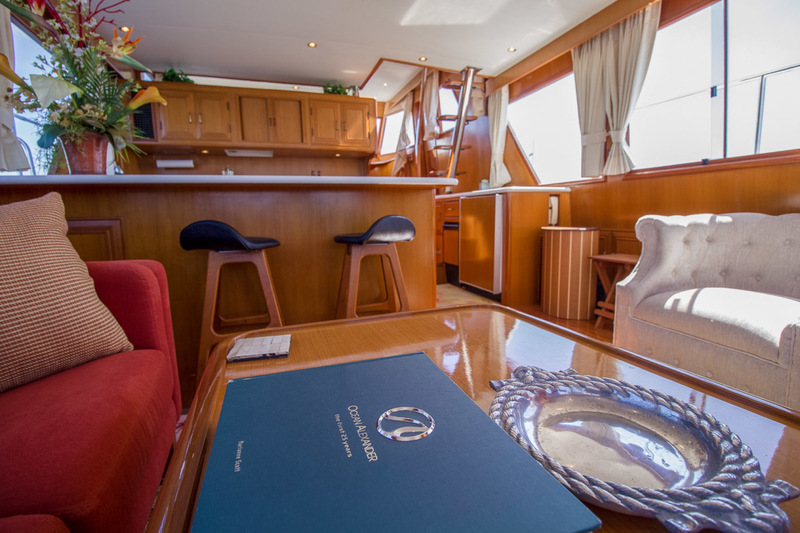 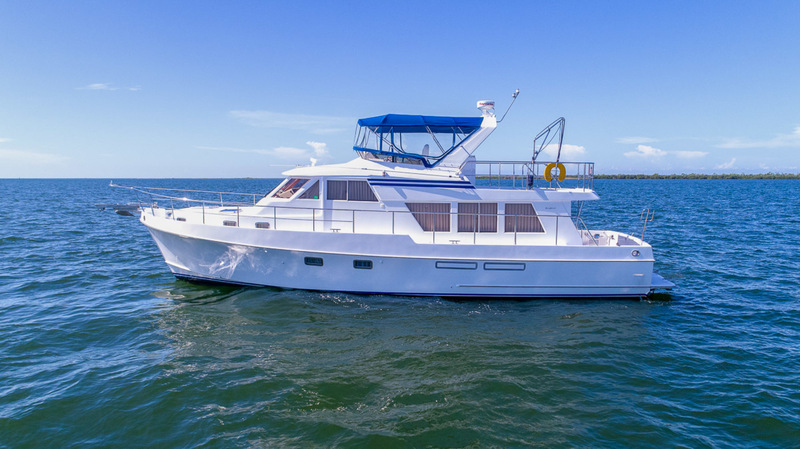 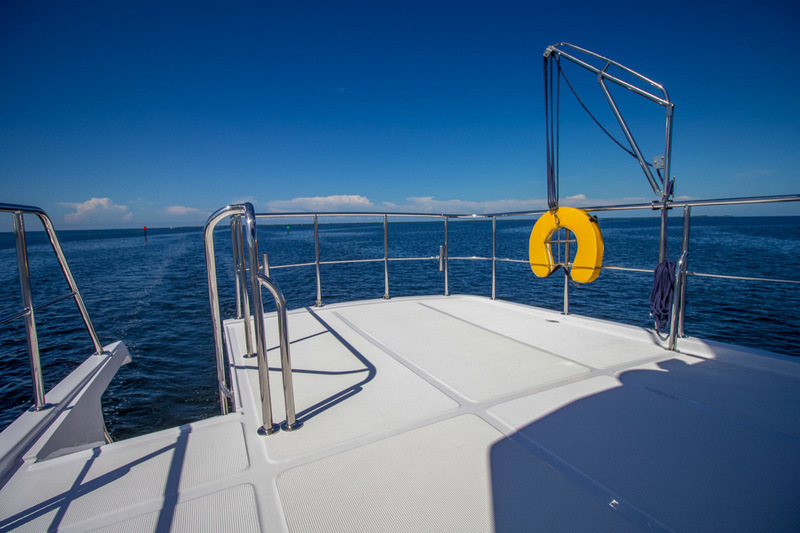 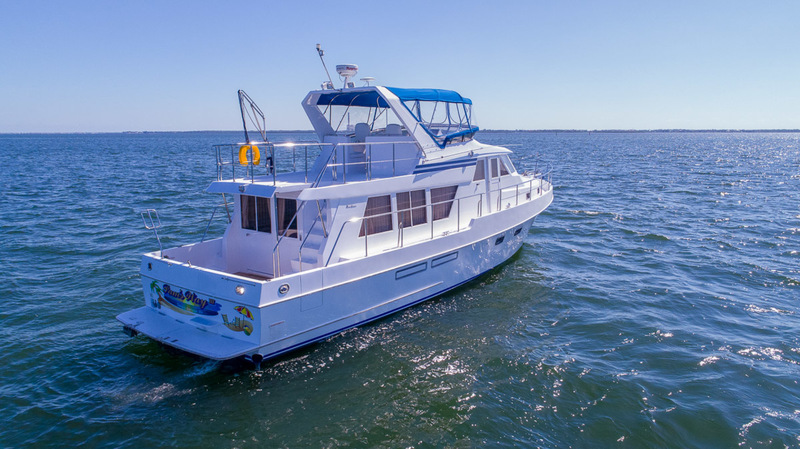 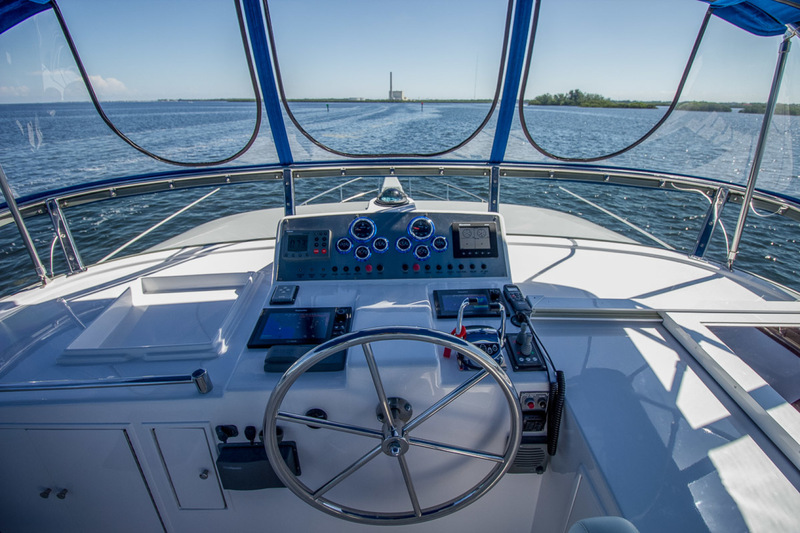 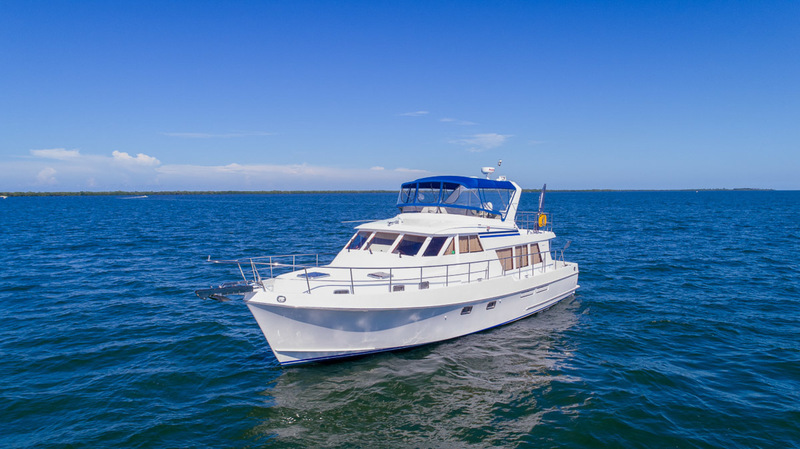 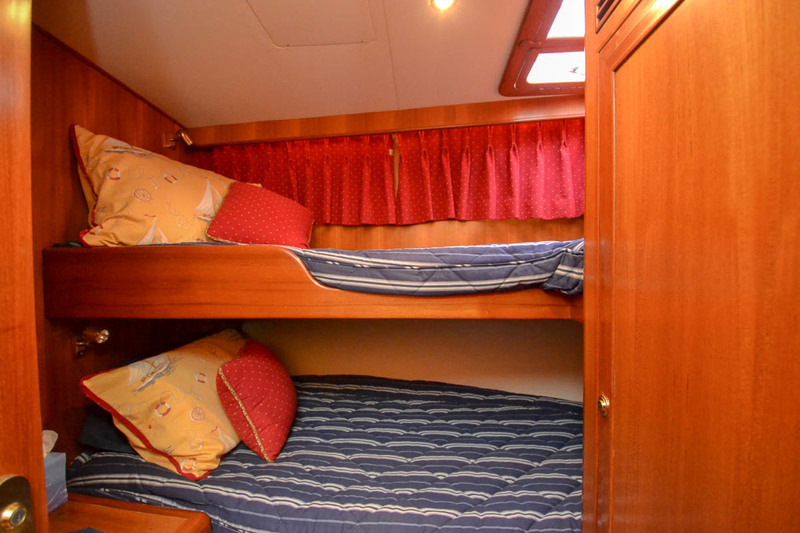 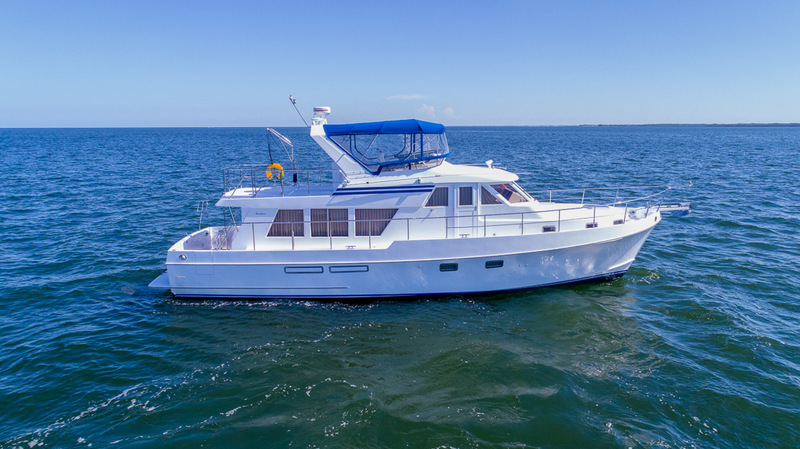 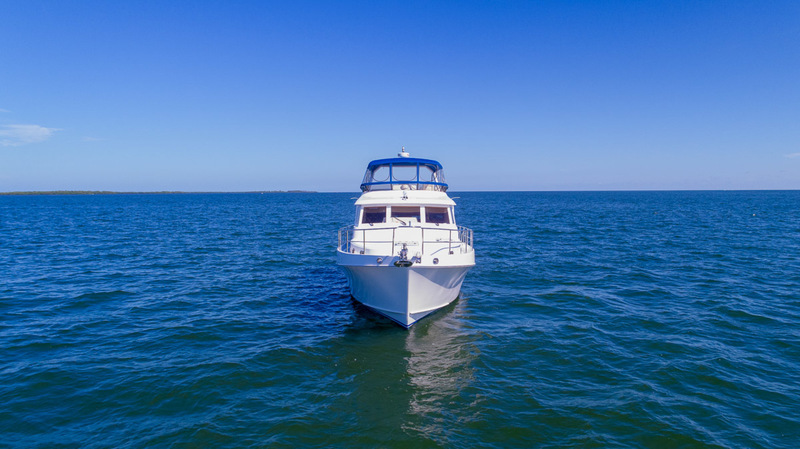 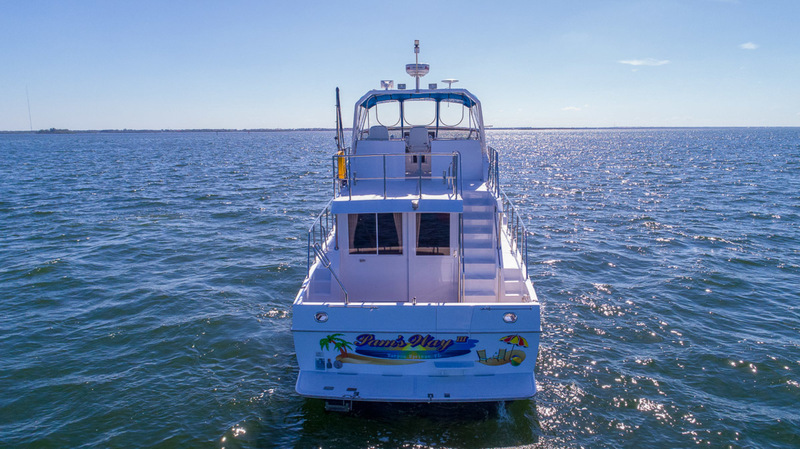 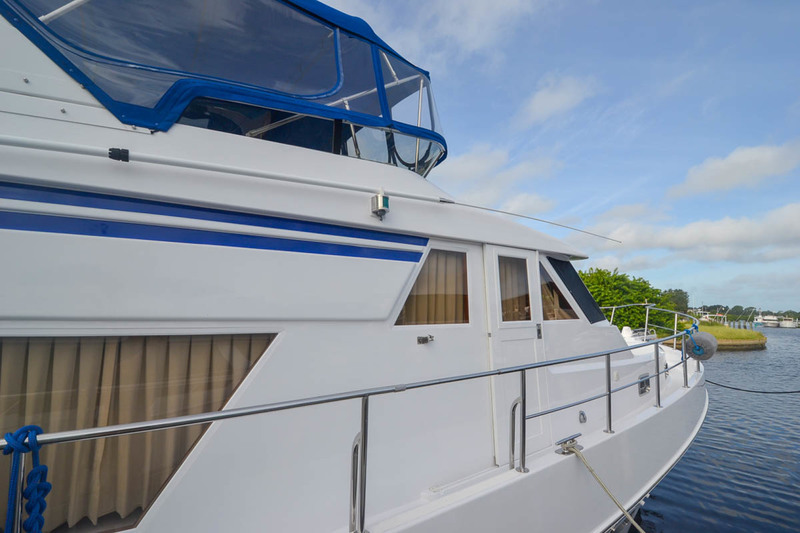 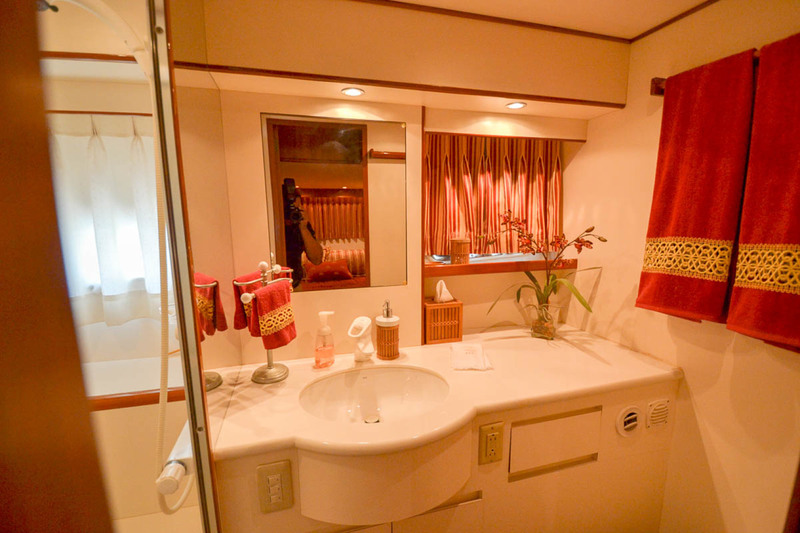 Aft of the pilothouse are the well equipped galley and salon with large cabin windows, teak and holly flooring, and sliding door opening to the spacious cockpit. 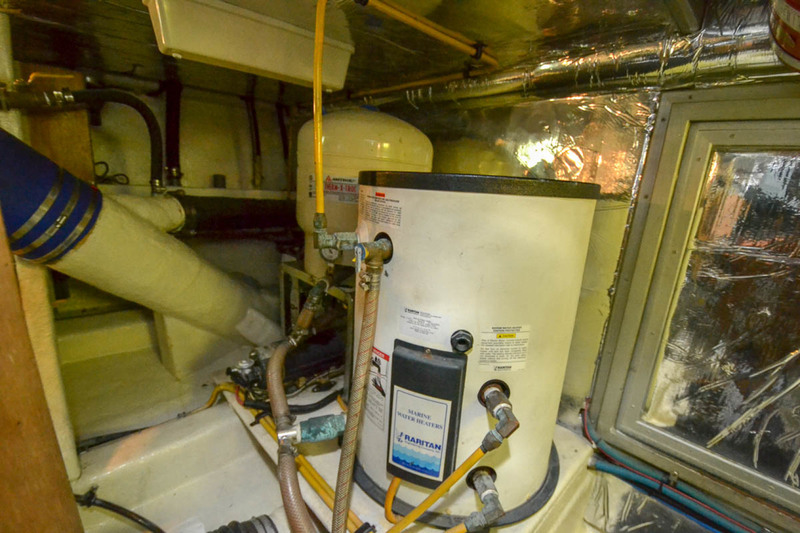 All of the exterior windows were resealed and both forward hatches replaced. 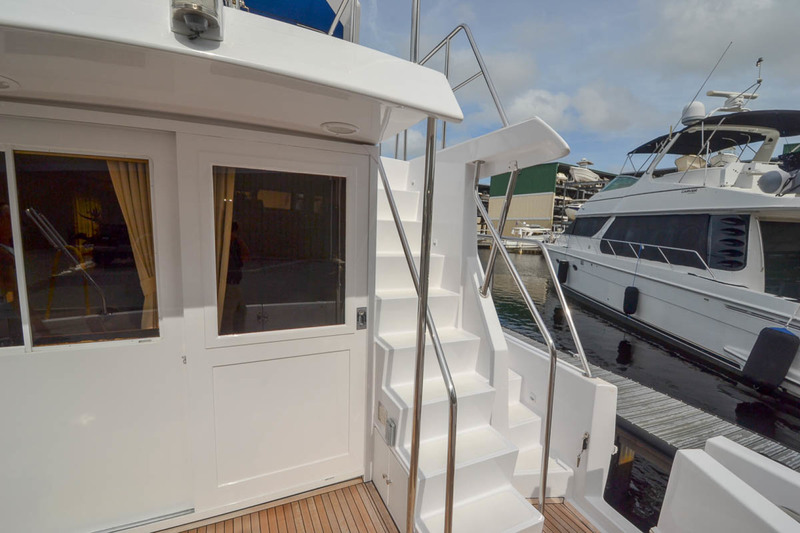 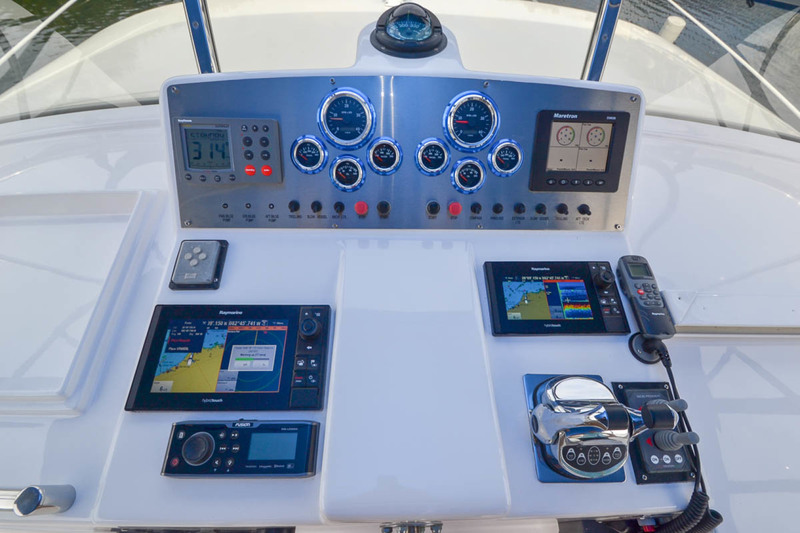 The side decks are wide and well protected, and there's space on the extended flybridge for a dinghy. 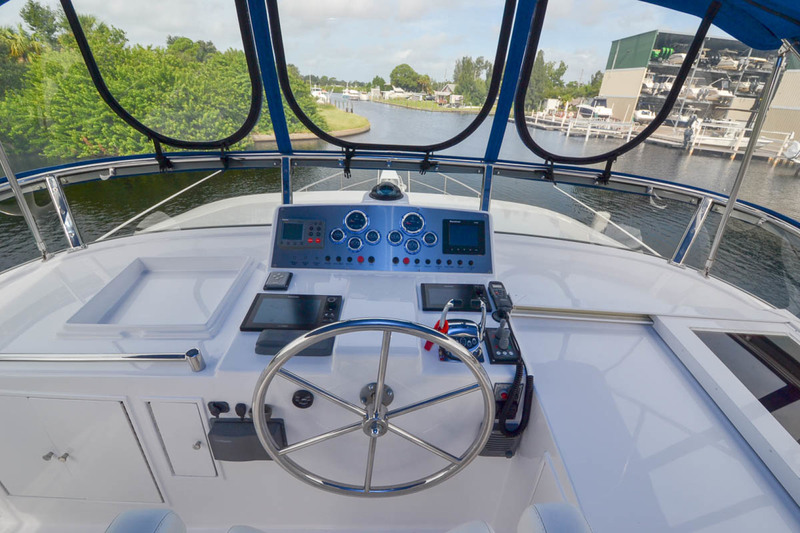 Additional features include a laundry center forward the engines, pilothouse deck access door, molded flybridge steps, and side transom door. 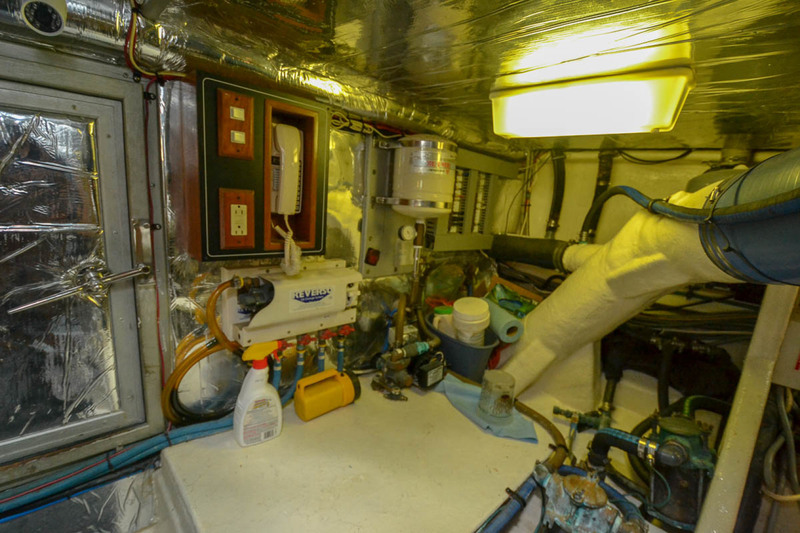 This yacht has seen multiple refits. 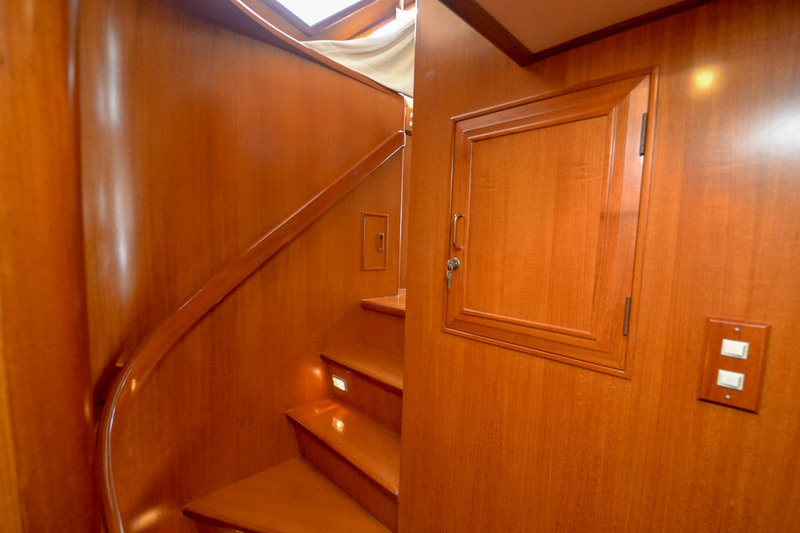 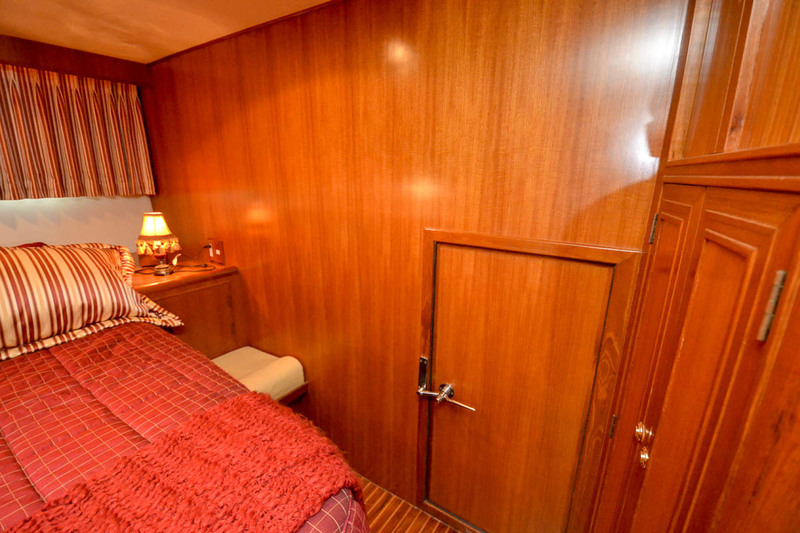 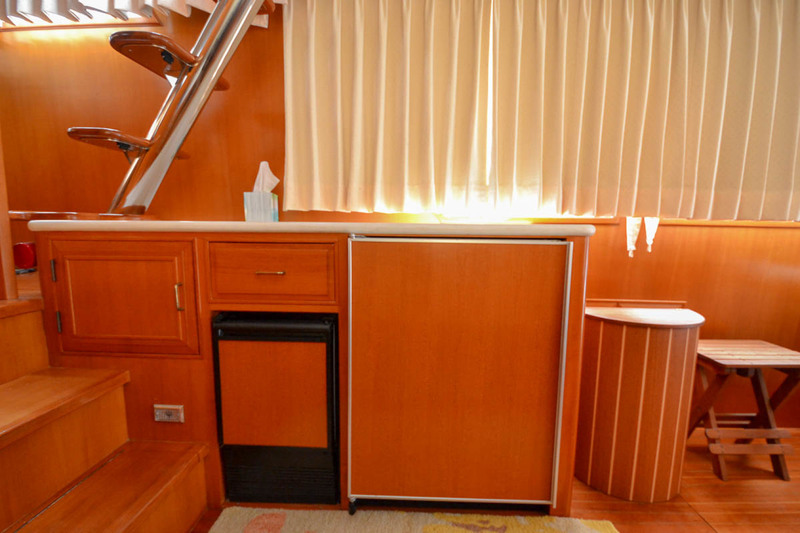 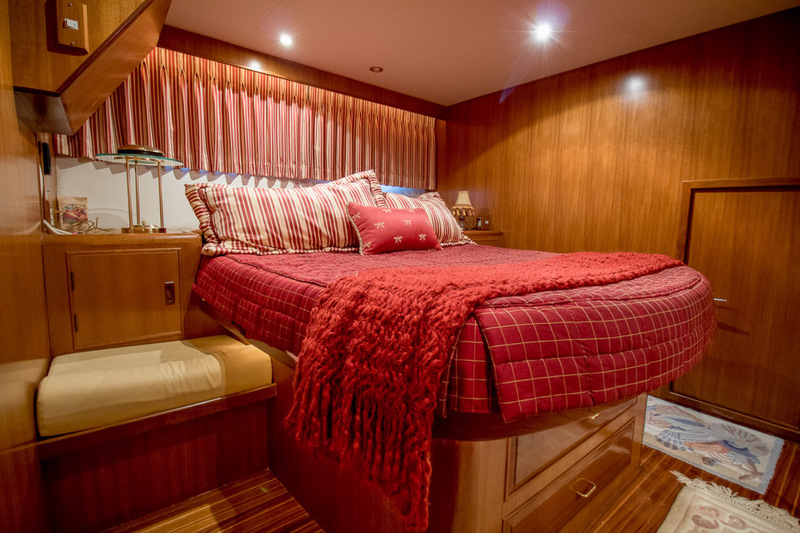 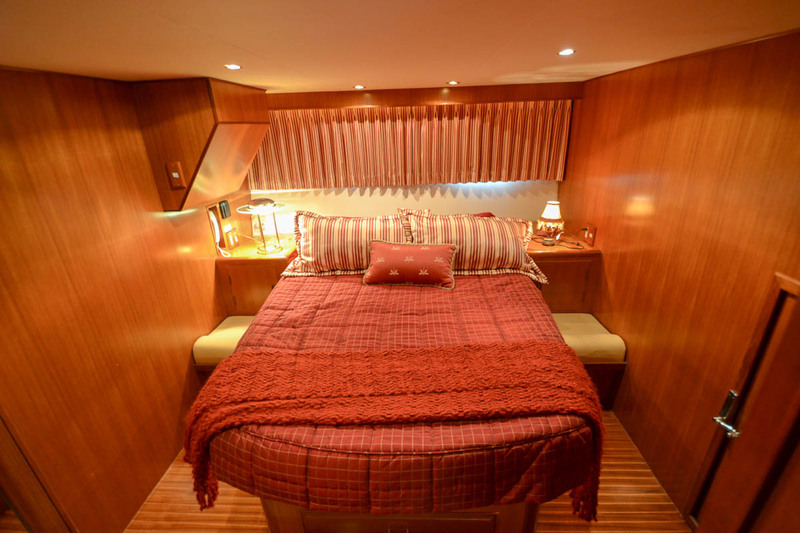 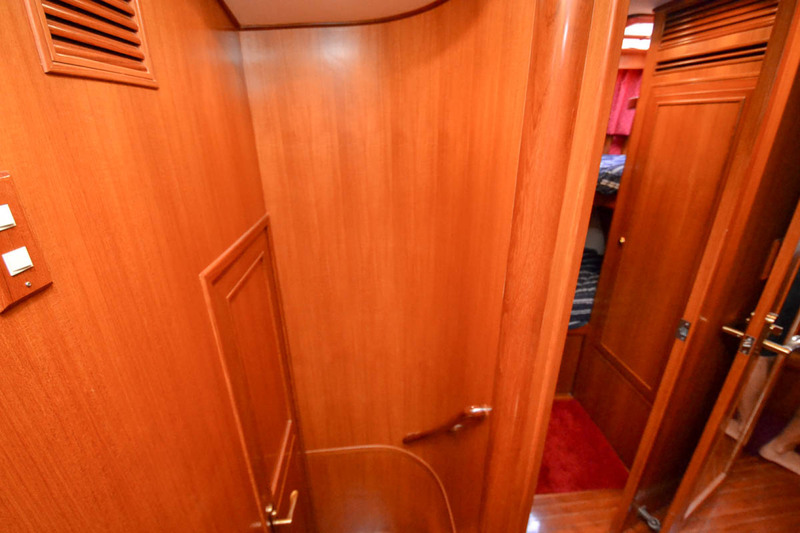 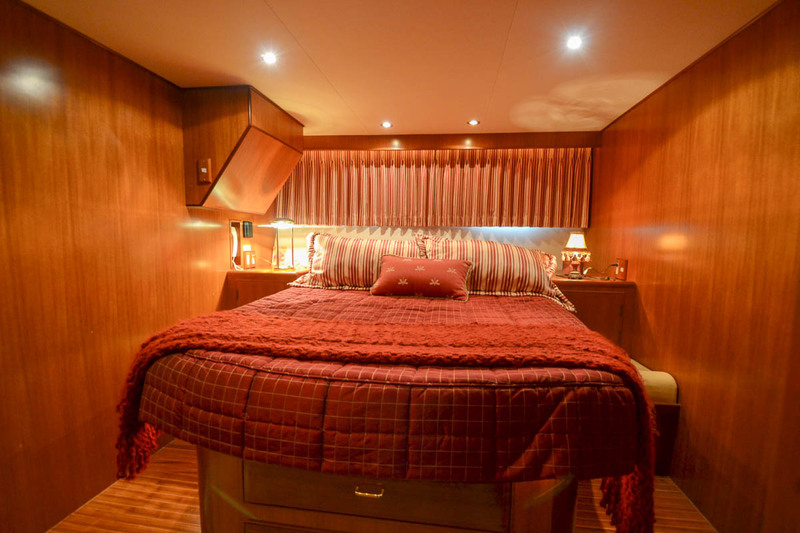 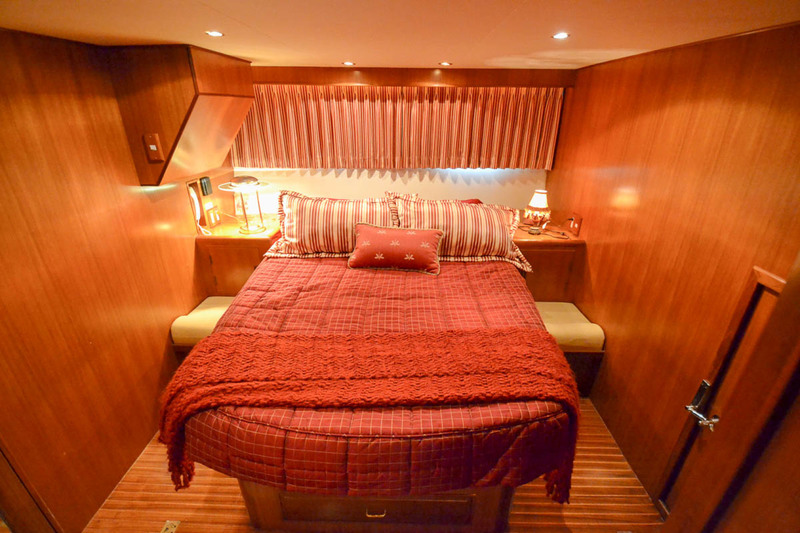 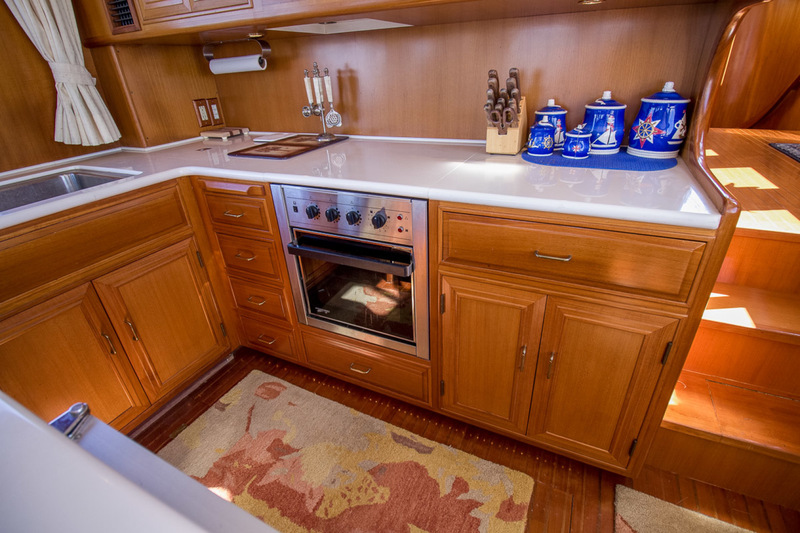 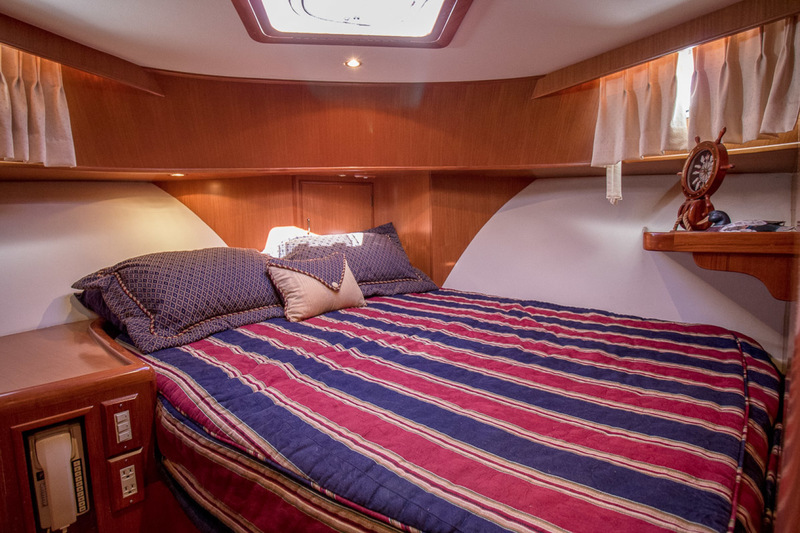 This yacht has been extremely well maintained and bodes handsome teak interior woodwork. 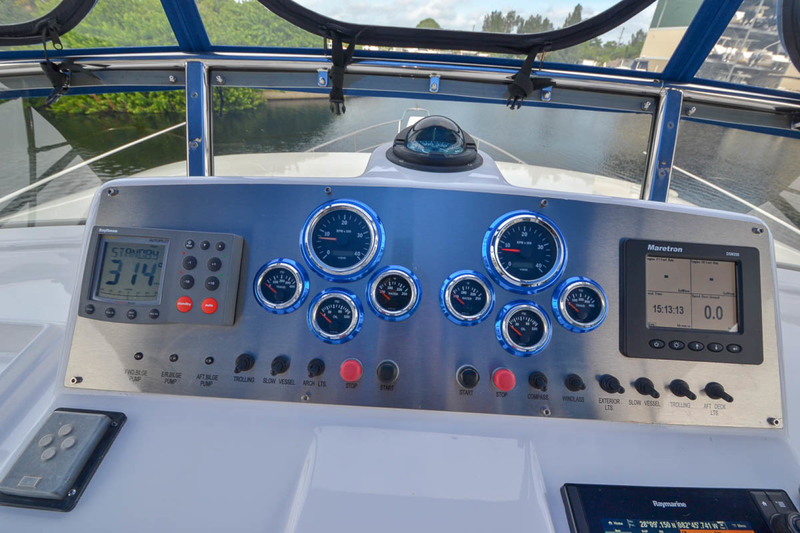 The cockpit teak was replaced in 2016. 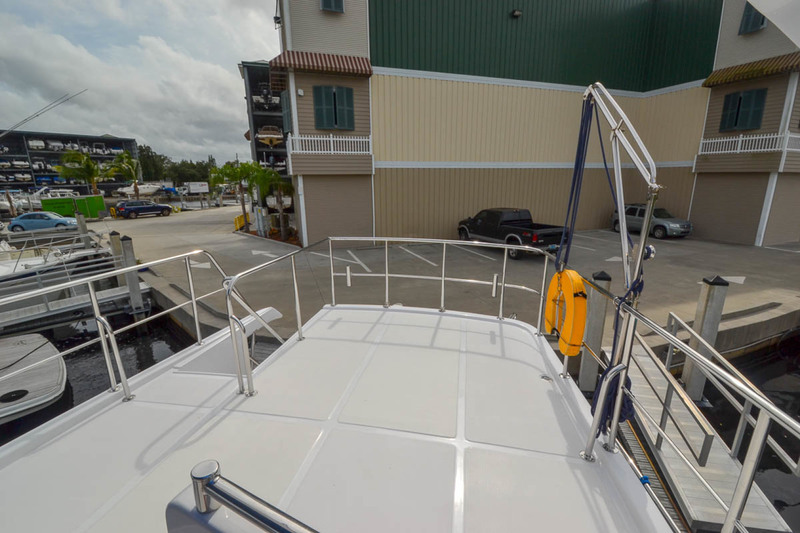 The current owner had her in the yard in 2016 for a full awlgrip paint job and new nonskid. 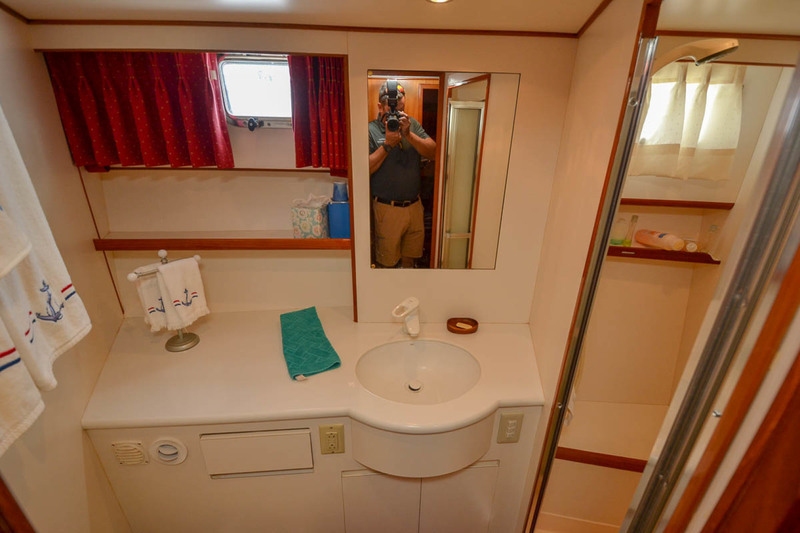 The bottom paint was done 05/2018. 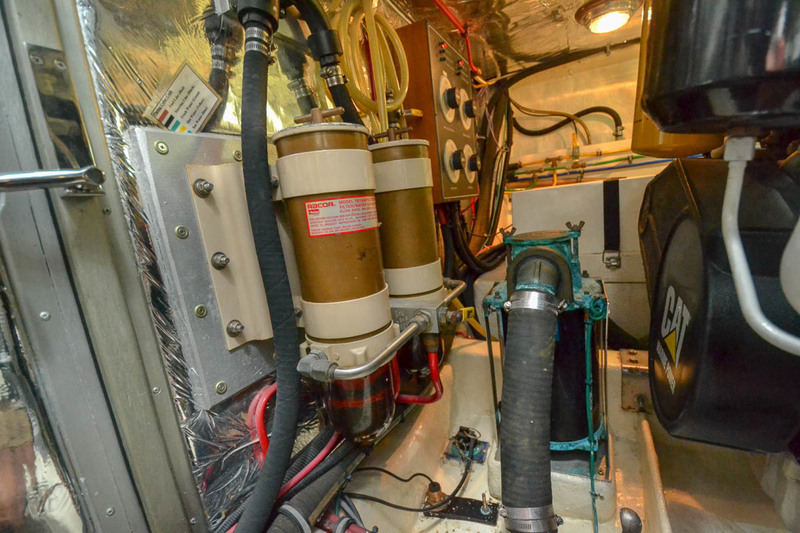 The mechanical updates are all very recent in 2016/17 with new aftercoolers, heat exchangers and exhaust elbows. 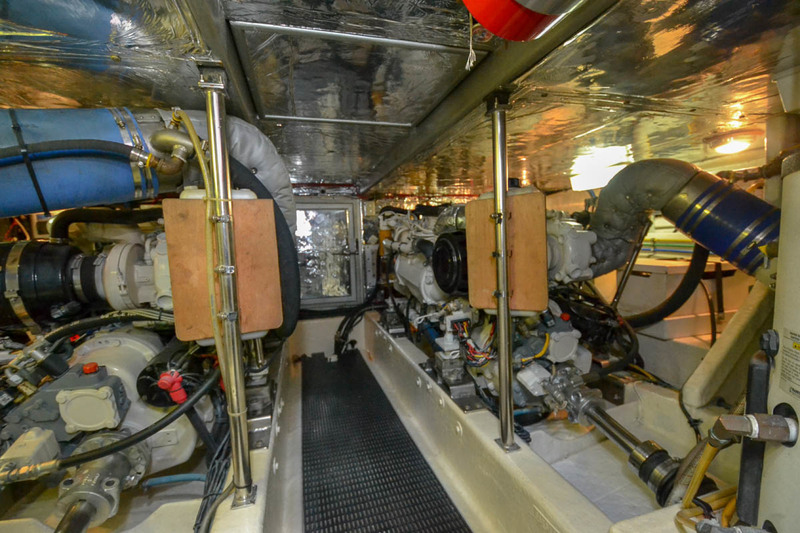 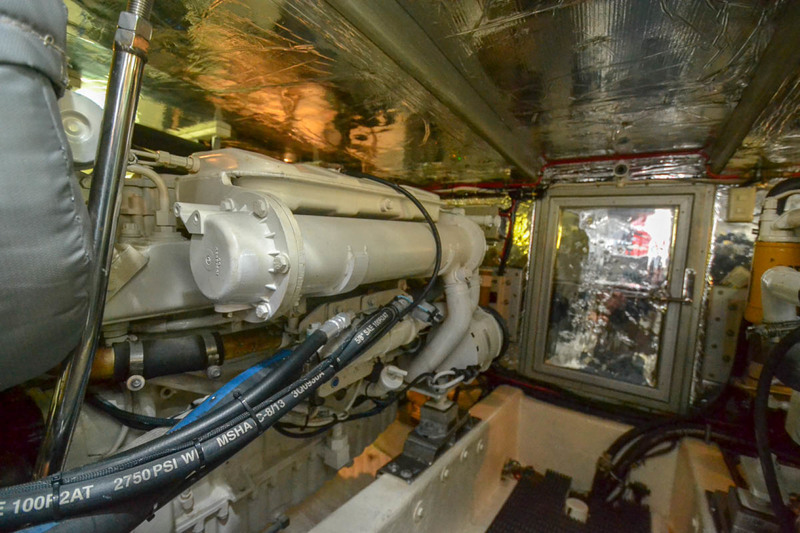 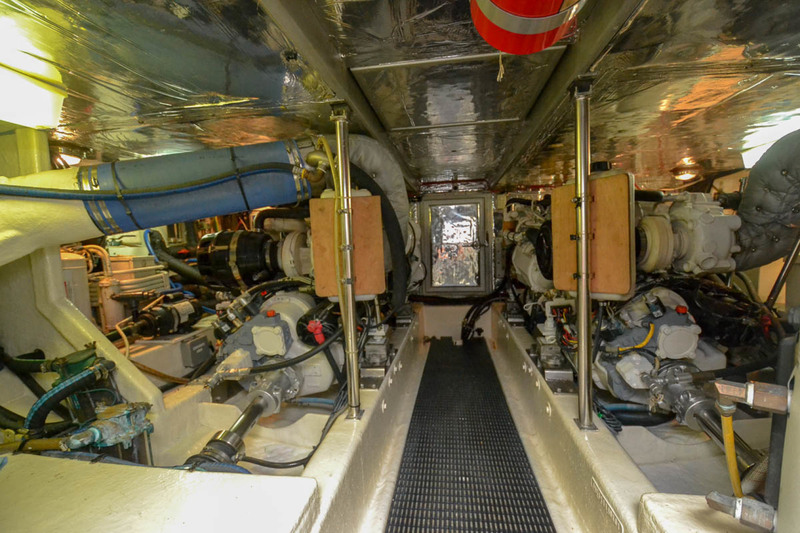 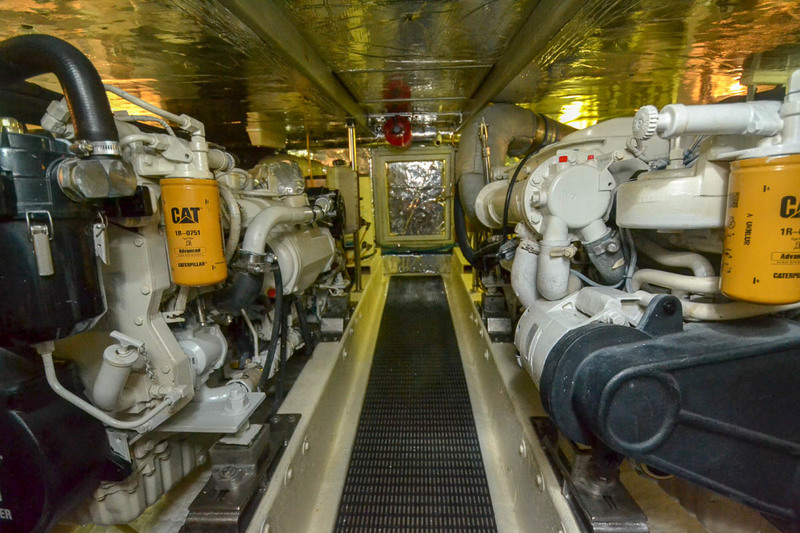 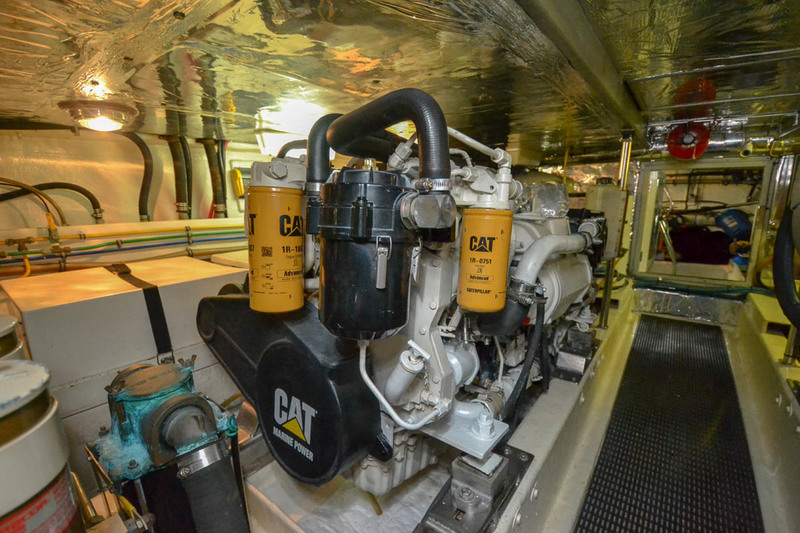 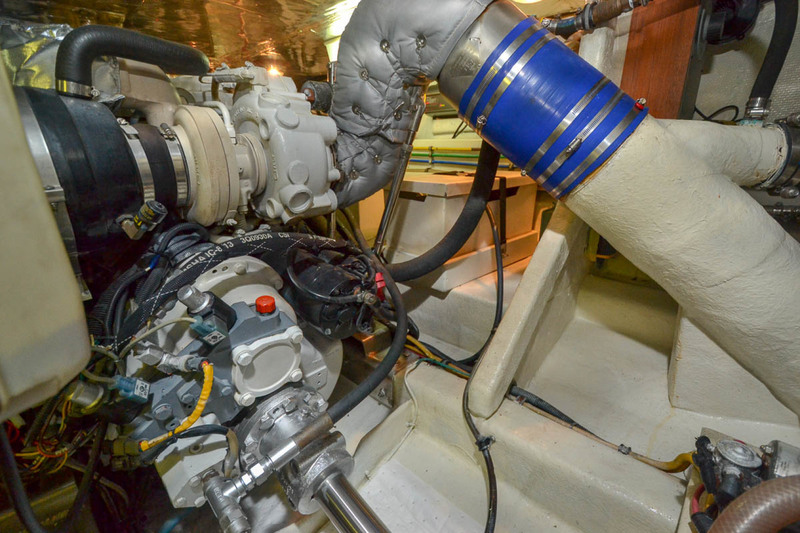 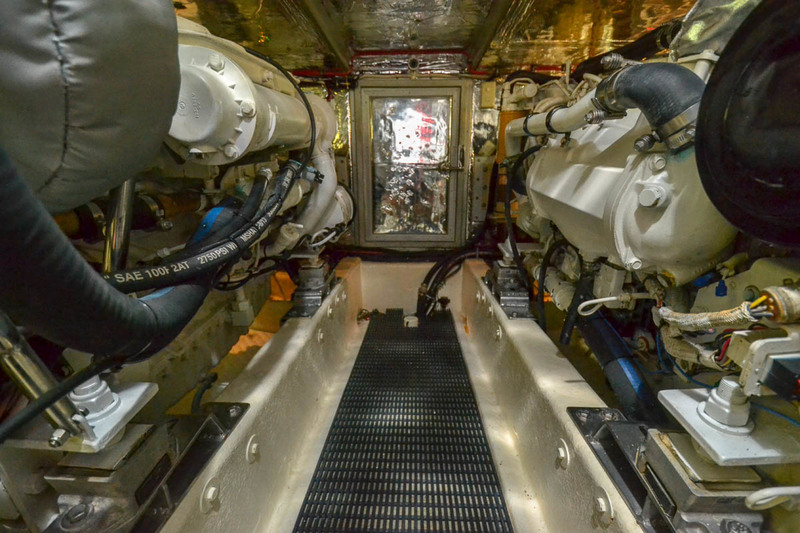 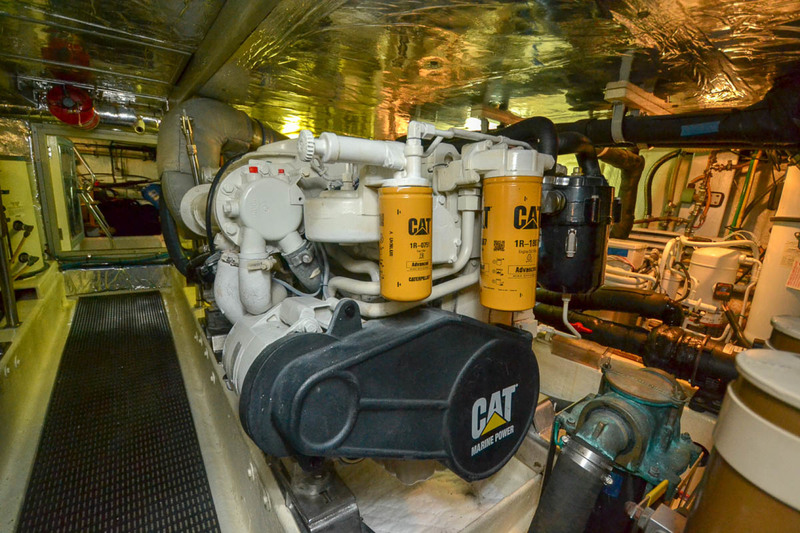 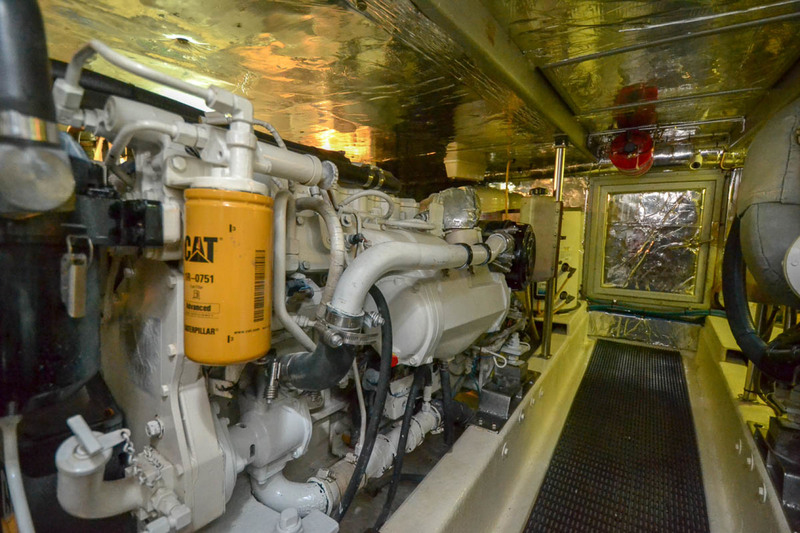 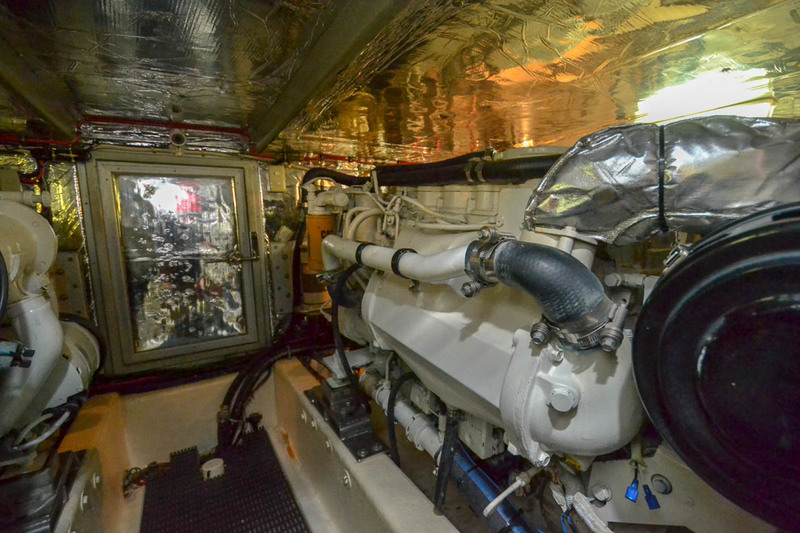 The 985 hour 3126B TA 450hp Caterpillar diesels will cruiser the boat 14 knots with a max of 20 knots. 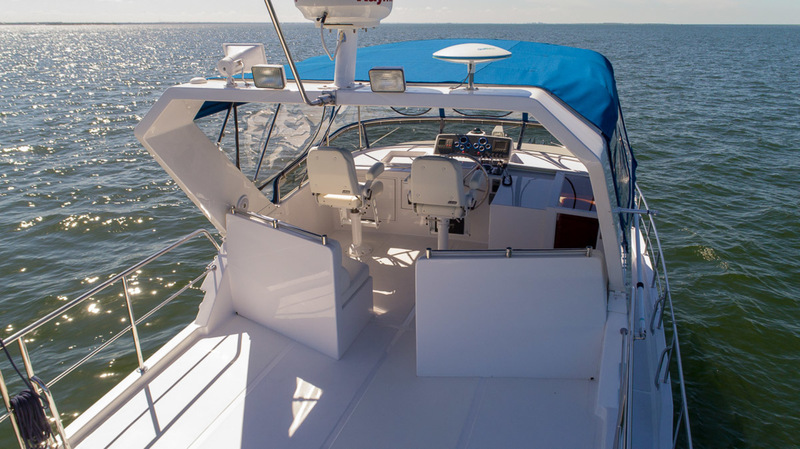 The owner finds the best economy at 1450 RPM and 9 knots only burning 10 GPH total making your range over 600 nautical miles. 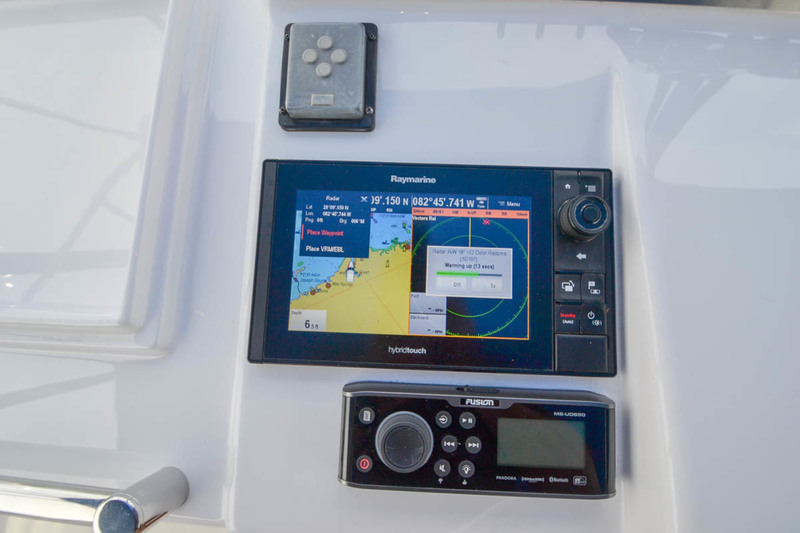 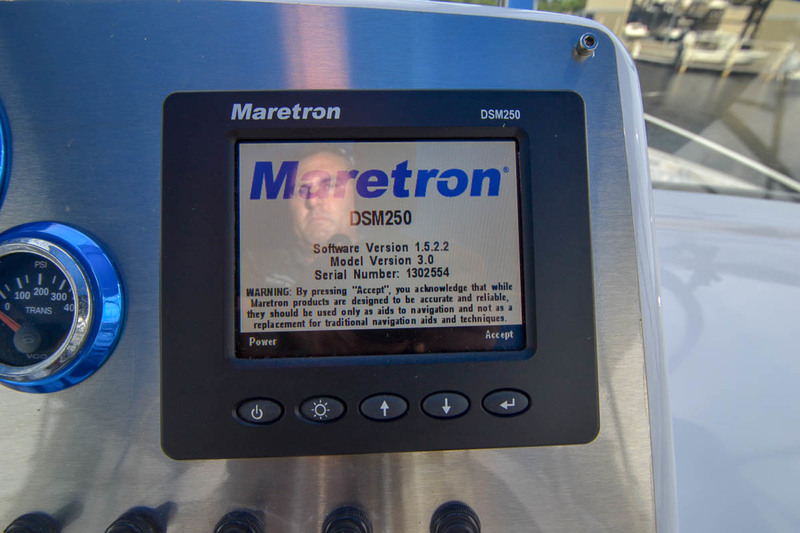 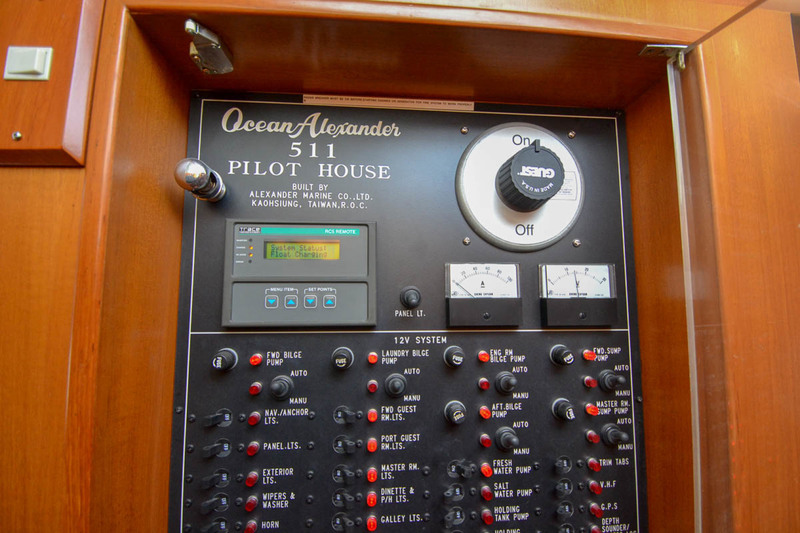 At a 14 knot cruise you consumption will go to 30 GPH reducing your range to 300 nautical miles. 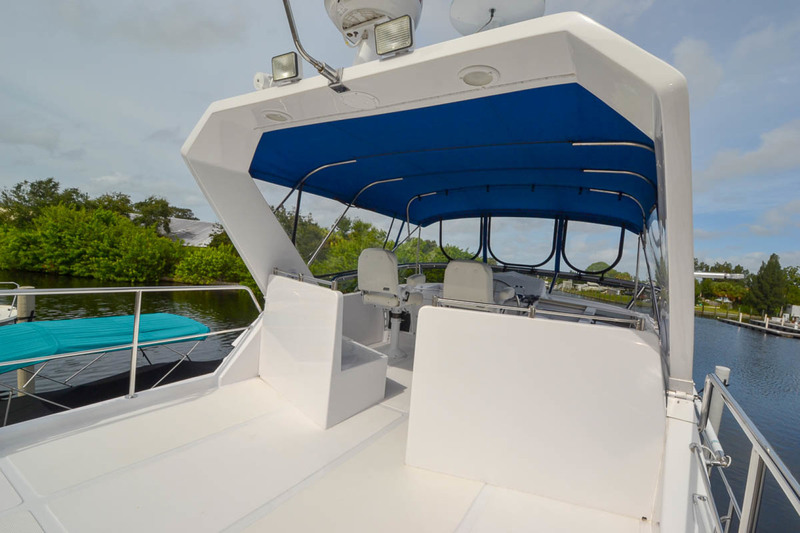 Multi-color underwater and radar arch lighting make this boat entertaining and stunning even when docked. 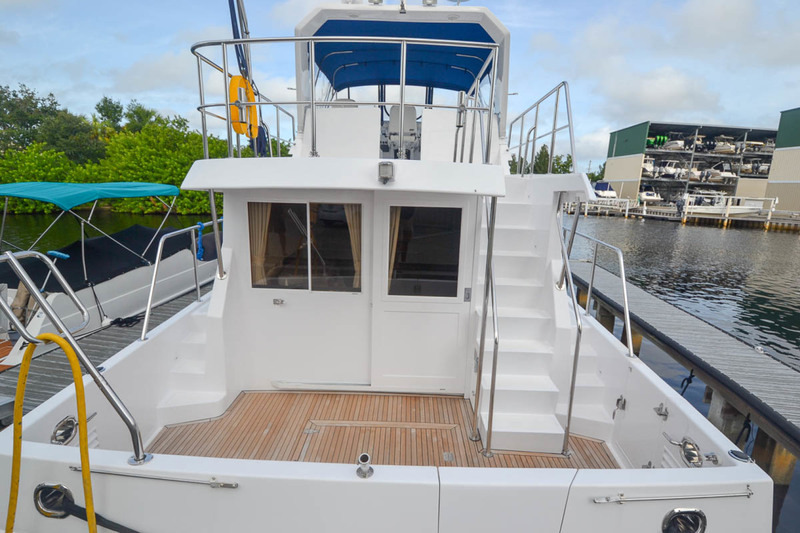 This yacht went thru a 2016/2017 refit with AwlGrip Alfair Paint waterline up, Bottom Paint 2017, Electronics & Canvas 2016, Windows rebedded and NEW stainless steel painted trim. 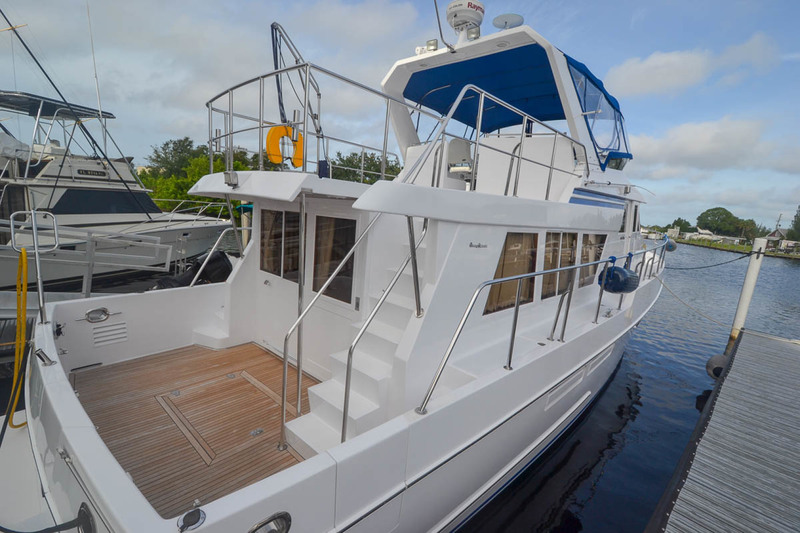 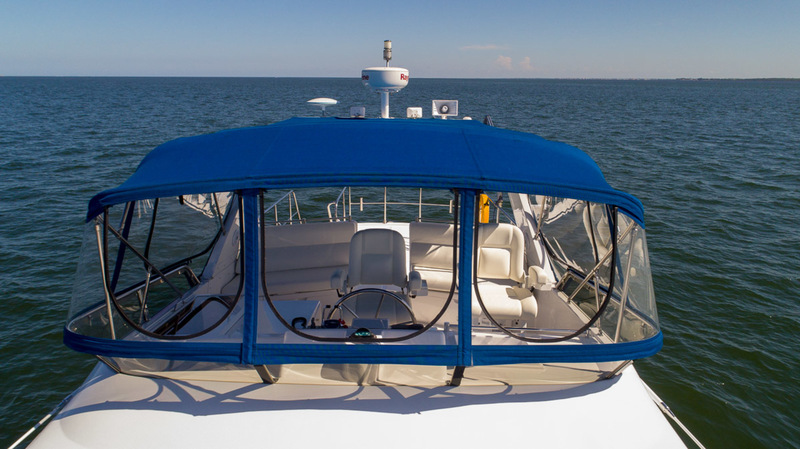 The white decks combined light gray seadek on walkaround decks walk make this a cruising boat for a couple to handle. 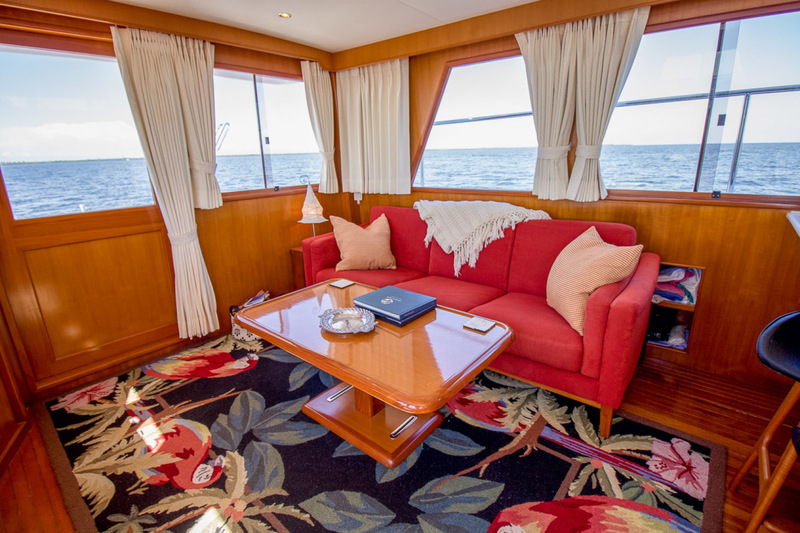 The cockpit has new teak from 2016, with room for deck chairs and a table. 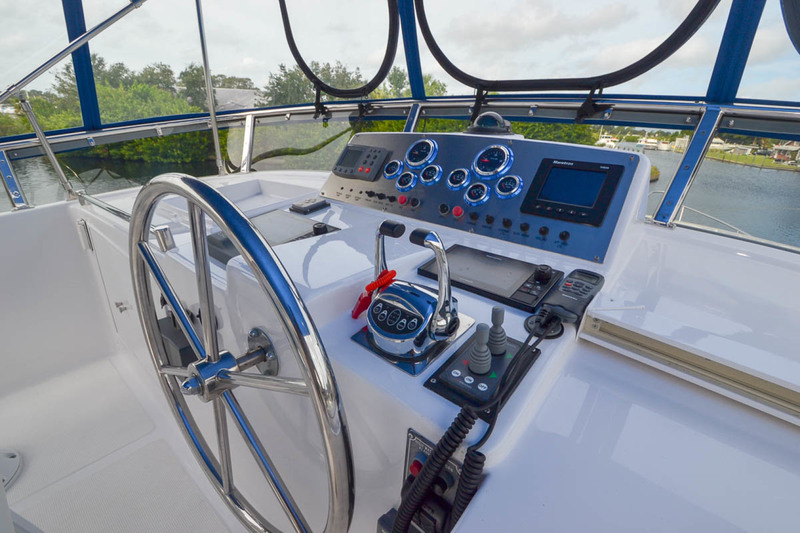 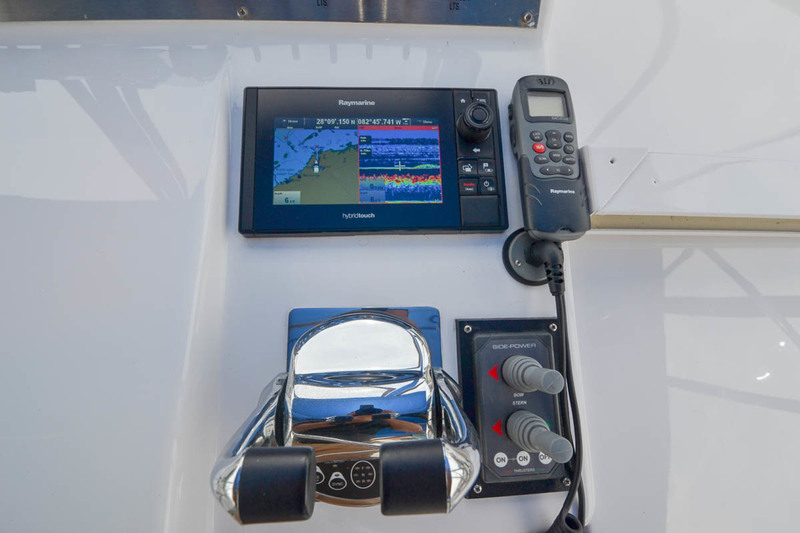 Her foredeck is easily managed with large bulwarks to prevent accidents and excellent ground tackle working areas. 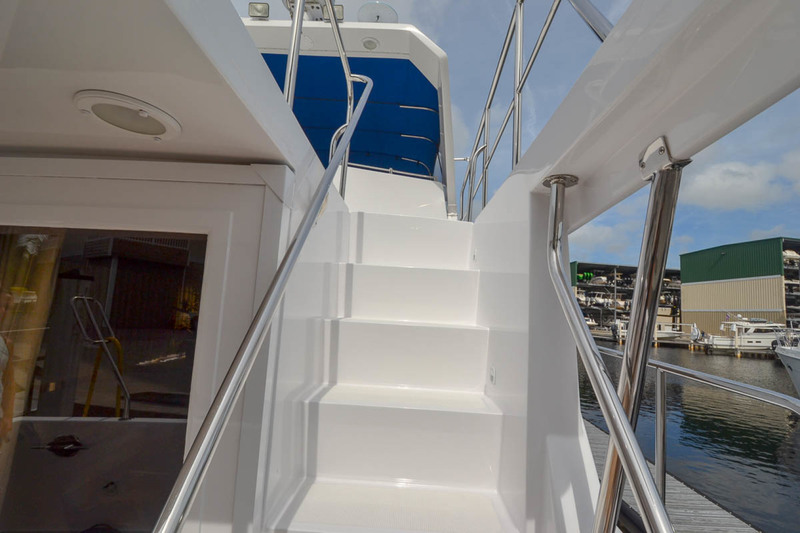 Wide walk around decks with S/S safety rails. 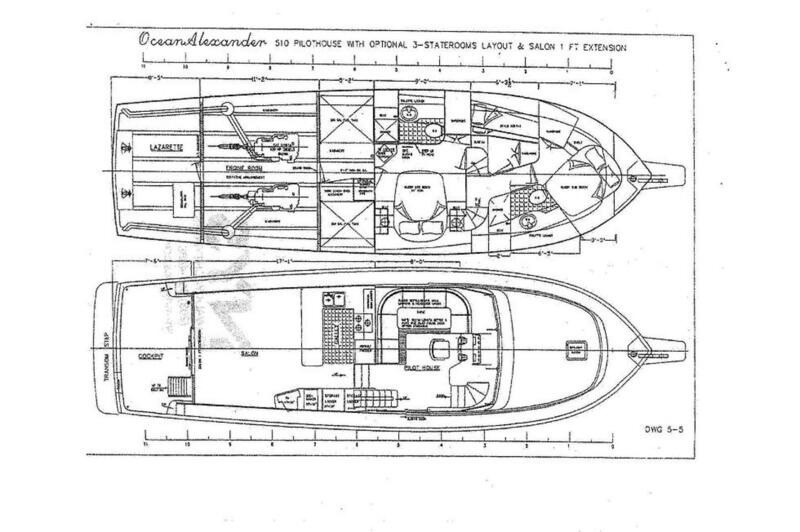 Entering through the Cockpit sole you are in the large Lazarette with the Steering System easily accessible. 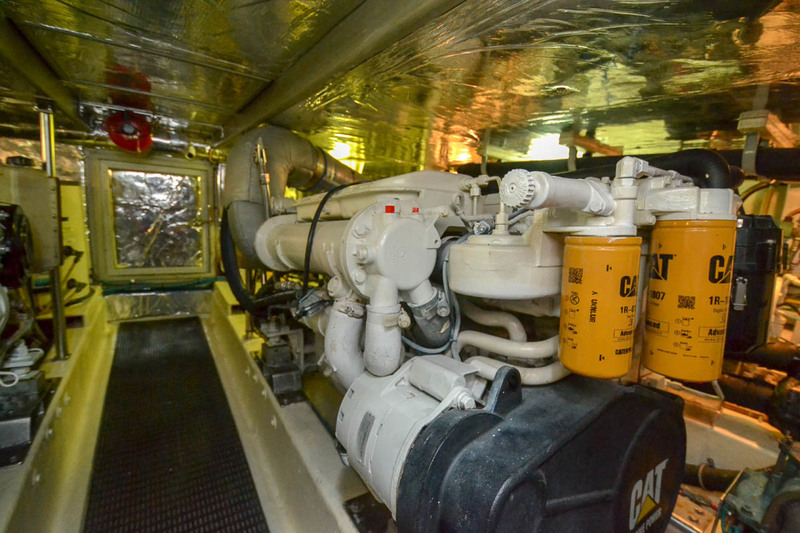 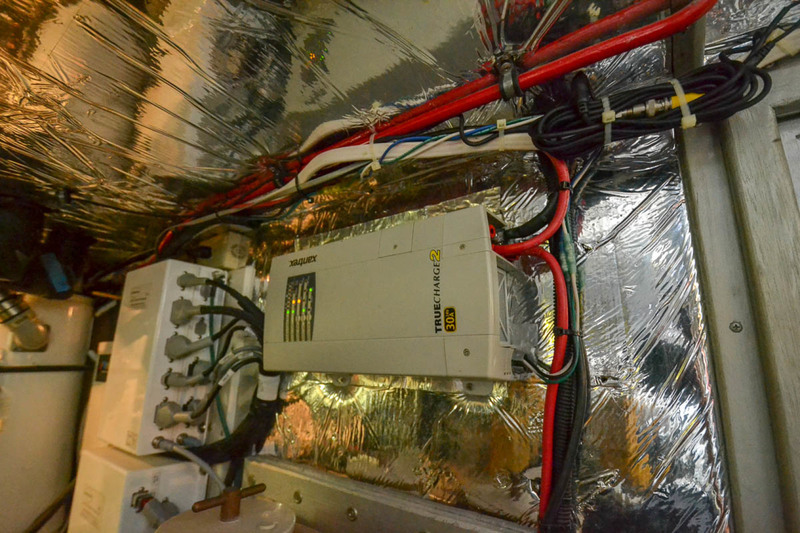 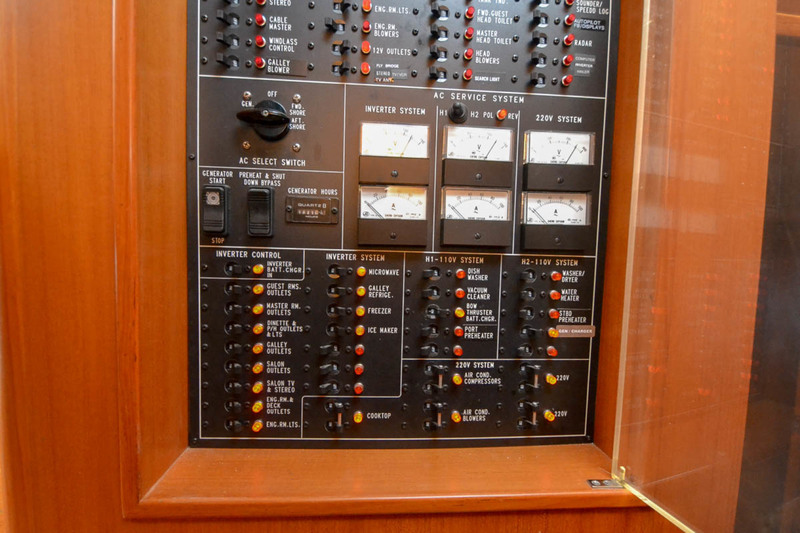 The Genset is in the Sound Box in the Lazarette. 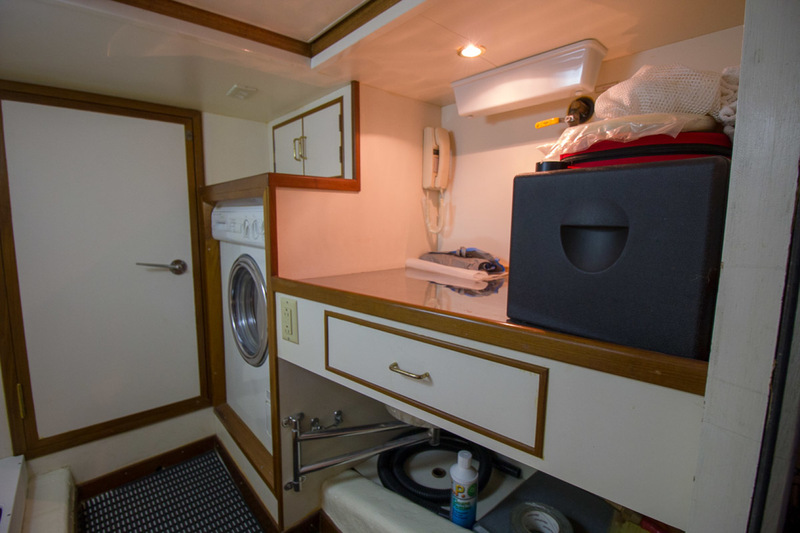 There is ample space to store fishing and crabbing equipment and more in this area. 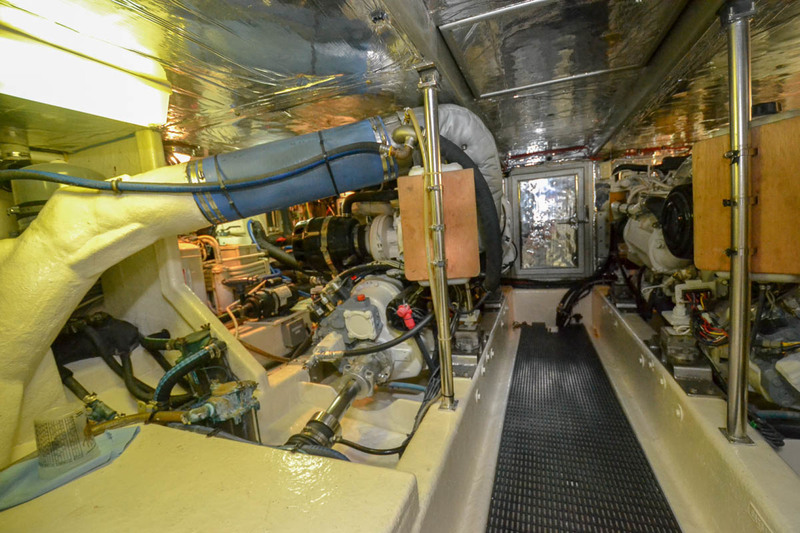 Forward through a door is the Engine Room with access to all four sides of the engines. 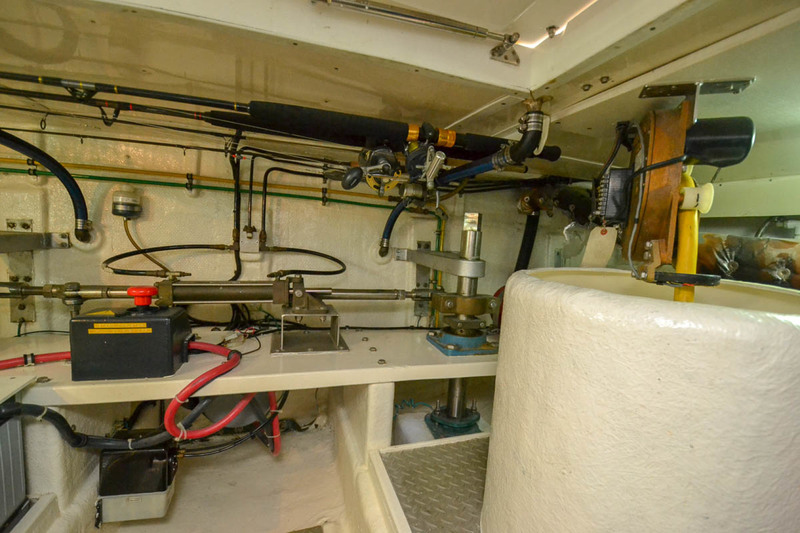 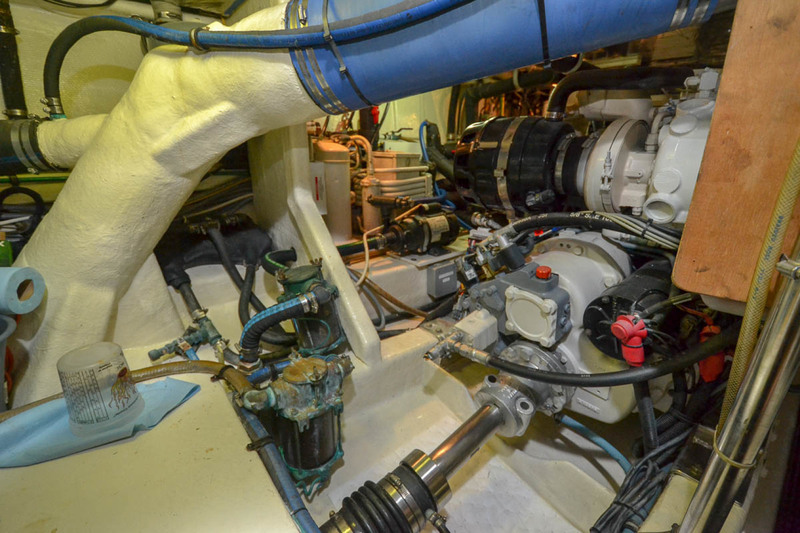 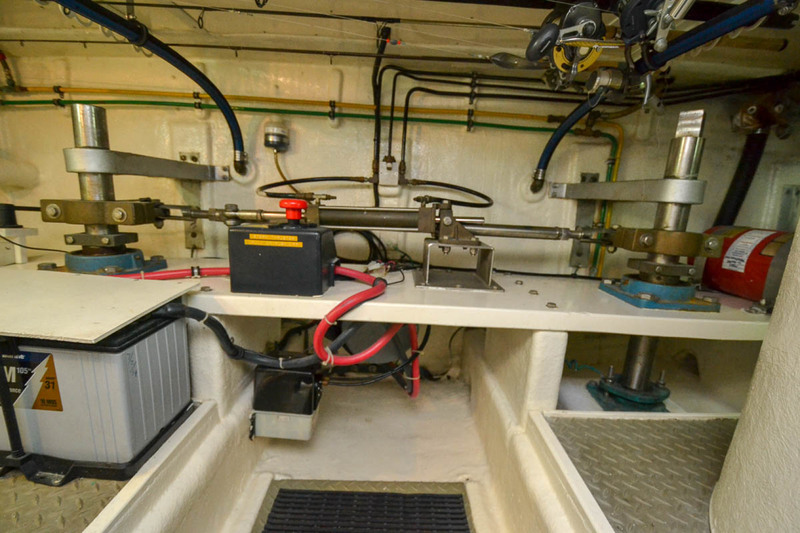 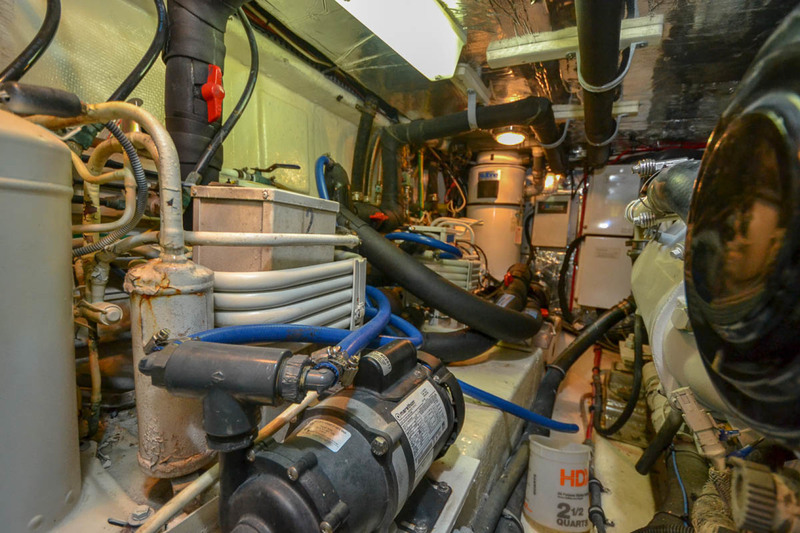 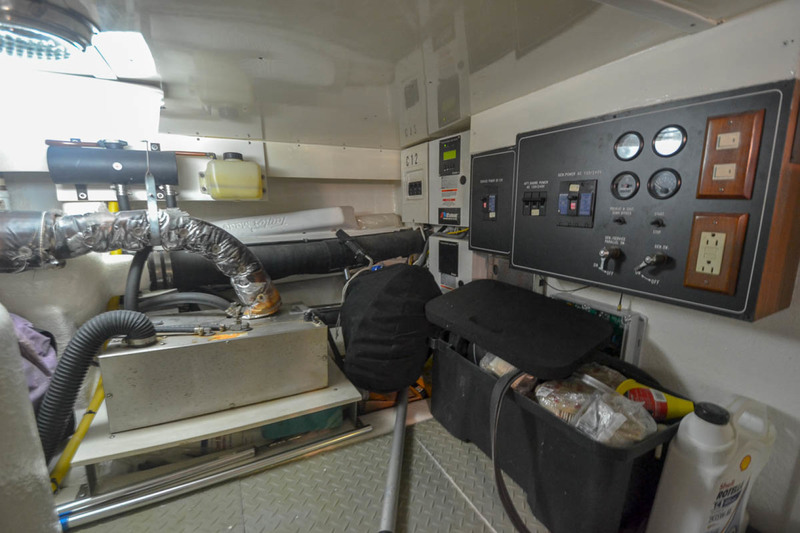 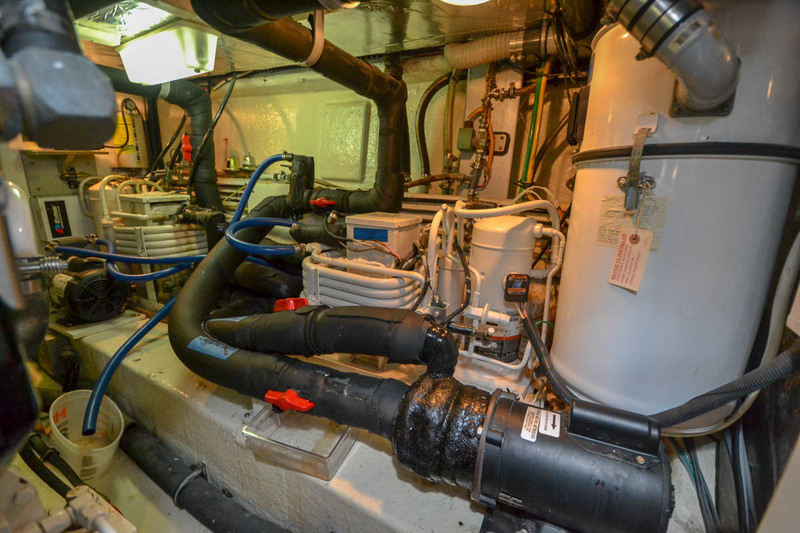 Forward of this is a Tank Room for incidental storage and inside access to the Engine Room through the Galley sole. 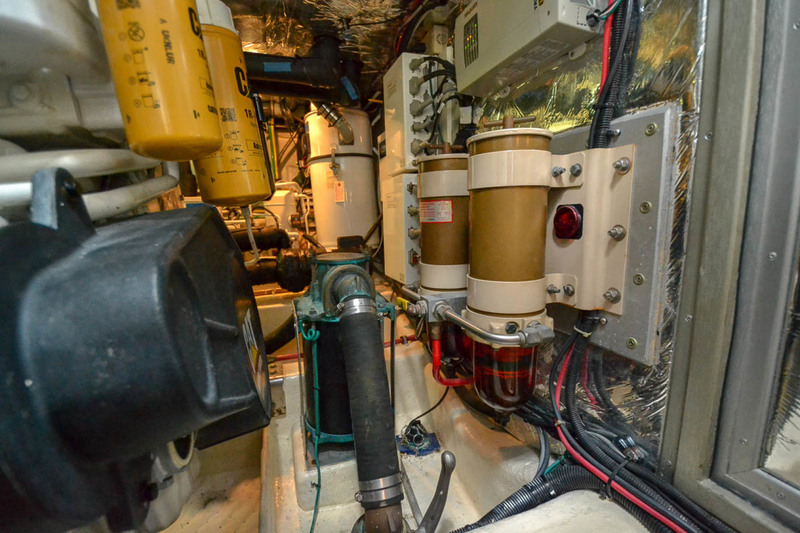 The Fuel Tanks are port and starboard.